Will Microsoft Edge Be Able To Succeed? - Pelbox Solutions Top rated web development mobile app development company. Will Microsoft Edge Be Able To Succeed? There are numerous web browsers out there, each with its set of advantages and disadvantages. Plus, every user has his or her preference when it comes to web browsers. A good number of users rely on Chrome, especially because it can sync your bookmarks and all other data with your Google account whereas many others choose Firefox. Similarly, Opera and Safari too, though less popular, are key players in the game. A while ago, Microsoft announced the launch of a new web browser, named Edge. While Microsoft has had Internet Explorer for decades now, the company has finally realized that the days of IE are numbered, and even gone ahead and retired all versions of Internet Explorer except version 11. That said, how exactly will the new web browser Edge fare? Will it be able to compete in a crowded world of web browsers? Sounds impressive so far? 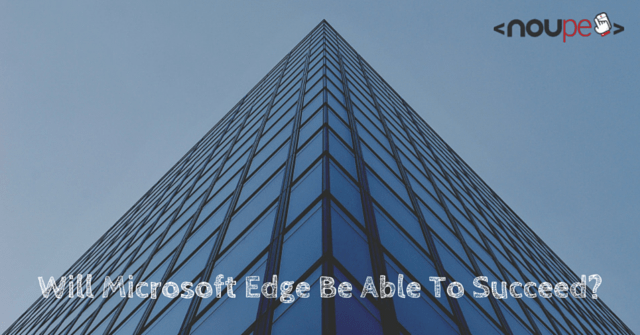 Edge also plans to focus heavily on modern HTML5 and CSS concepts to enhance accessibility features for users and offer a new set of developer tools meant exclusively for building and testing accessible websites. But all of the shiny new features and ideas apart, how is Edge doing so far? Well, Microsoft decided to offer Windows 10 as a free upgrade to most of the users around the world, and with that, Edge also got a chance to become the default browser on a lot of devices. Of course, being the default browser on an operating system does not mean the users will make it their default web browser, but it still provided Edge with a fighting chance. Several users do not bother changing the default web browser, or installing a new one, and might in fact just continue using Edge. However, the idea, though pretty good, has so far been implemented poorly. Forcing or urging users to “give Microsoft Edge a shot” is a poor strategy. At best, it will make users annoyed with Edge even before they use it, and at worst, it will cause a domino effect and encourage users to turn towards alternative web browsers, and abandon Edge in total. There are many already established and powerful web browsers out there — Chrome, Firefox, Opera, Safari, you name it! Edge will face a stiff challenge from some of them. Safari can be ruled out — for the most part, Safari is what Apple fanboys use, and Edge is probably not going to target that user niche anyway. Chrome, Opera and Firefox, however, are a different story. Edge is making some amends by taking things away from the local machine, and integrating with Windows and Microsoft accounts of users to help them sync their data. Similarly, steps such as open sourcing its ChakraCore Engine are the need of the hour, and this can help Edge get some minor boost in its bid to challenge Firefox. Mozilla has had an excellent reputation in the open source world (something Microsoft has never had), and by turning towards open source, Edge can get some love from the community. However, browsers such as Opera, in spite of their relatively smaller user base, continue to be extremely relevant on account of one key aspect: mobile internet. This is where Edge is repeating the flaws of its predecessor Internet Explorer — it has so far shown not so much interest in the mobile user base. Agreed, Edge is going to be a standard feature on Windows mobile devices, such as tablets. However, unlike Chrome, Firefox or Opera, Edge is not in the least exhibiting any particular concern towards the mobile user base. In fact, so far, Microsoft has wanted to make Edge “the web browser of Windows users”, and not “the web browser of the masses”. MS has been asking users to make Edge their default browser, but the “outreach” aspect has just not been there — users are presented with Edge when they upgrade to Windows 10, but the same enthusiasm to try and bring Android users towards Edge is absent. And for what it’s worth, Edge can never dream of replacing or giving Chrome or even Opera a run for their money unless it is truly cross-platform and universally available. As such, Edge does look promising and has a good deal of features in its arsenal. Unlike Internet Explorer 6 and some other versions, that proved to be a nightmare for web developers, in the long run, Edge is offering many features that can be of use for developers. However, in the absence of a proper cross-platform usage strategy, Edge might just find itself relegated to the Windows 10 desktop, and much like Internet Explorer, it will fail to compete in the crowded web browser world. Therefore, Microsoft should, once more, try to do something that it has rarely done — treat the other platforms with the respect they deserve. It has shown a lot of love to open source in the past few months, and carrying on with this trend it should try to bring Edge to the users of platforms such as Android or even Ubuntu. Otherwise, if it remains “exclusive to Windows 10”, Edge will be Internet Explorer encore. What do you think of Microsoft Edge? Given it a spin yet? Share your views in the comments below!